Material: Flexible acrylic. Size: 14 Gauge (1.6mm). within 24 hours. Material: Bio Flexible Acrylic. Length : 10mm. Colour: Clear. Size: 16 Gauge (1.2mm). Type: Curved Bars Gauge: 14gauge (1.6mm) Length: 7/16" (11mm) Color: Clear Material: Silicone Quantity: 10 piece Package Contents: 10 x Belly Rings Piercing Note: Light shooting and different displays may cause the color of the item in the picture a little different from the real thing. The measurement allowed error is /- 1-3cm. Brand Unbranded MPN Does not apply UPC 190268839303. Material: Bio Flexible Acrylic. Length : 8mm. Colour: Clear. Size: 16 Gauge (1.2mm). Length: 12mm. Material: Flexible acrylic. Size: 14 Gauge (1.6mm). within 24 hours. Length: 8mm. Material: Flexible acrylic. Size: 16 Gauge (1.2mm). within 24 hours. Gauge: 16g. 10 x 8mm 16G eyebow ring. 10 x 10mm 16G eyebow ring. 20 pieces of curved eyebow rings. Pole Length: Approx. 10 mm and 8mm. Color: Clear. Designed for retaining nose, ear piercing. PTFE is worn esp if you have issues with piercings that won't heal or easily irritated. PTFE piercing jewellery is a great solution. Perfect fit for your nose / ear pierce. Body area: Nose. Length: 8mm. Colour: Clear. Size: 18 Gauge (1.0mm). within 24 hours. Length: 16mm. Material: Flexible acrylic. Size: 14 Gauge (1.6mm). within 24 hours. Gauge: 18g. 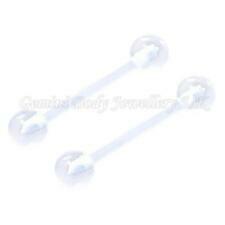 Clear nose studs retainers with ball top. 20 x nose studs. Material: Acrylic. Color: Clear.